Lily’s going to have her first knitted sweater soon! 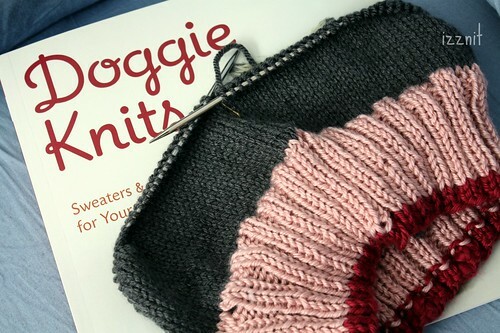 The pattern I’m using is “Agnes” from the book Doggie Knits. I had to make modifications for her unique figure (large chest, muscular legs, and small torso) but it’s still working up quickly. I know I have a few readers that own frenchies so I’ll share the mods when I’m finished. awww how cute! i can’t wait to see her in it! Cute! I have a patons book that is all dog knits. There is one that is a dinosaur jumper that I want to make my parents dog. It is super cute! Modifying dog patterns seems kind of intimidating to me. My sister keeps hinting that she’d like a sweater for her terrier because he doesn’t have a lot of fur, but I have no idea how to get it to fit right. 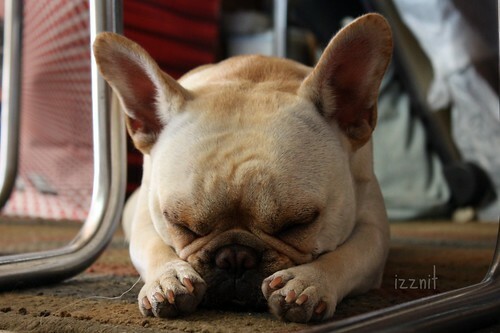 That picture of Lily sleeping is so cute! Please update how you modified for your frenchie! I want to make one for mine! LOVE IT! !